One would think that nonprofits would be the leaders of a post-industrial leadership model. The industrial model emphasizes top-down management more reminiscent of the military than an up-to-date organization based on sound management and enlightened humanistic psychological theory. 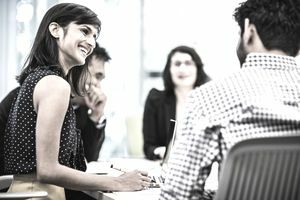 Moreover, nonprofit organizations already have a reputation for collegiality, flatter management structures, and, most of all, kind hearts and intentions to keep their employees happy and engaged. That's particularly true of high impact nonprofits, such as those described in Forces for Good by Leslie Crutchfield and Heather McLeod Grant. In fact, Many people flee their corporate cubicles to work for nonprofits just because those organizations seem more congenial. When looking for a new organizational model for your nonprofit, a shared leadership concept might be precisely what you need. By leveraging the strengths of all your team members (not just your directors or managers), your organization can improve both efficiency and effectiveness. However, shared leadership is more than just a fad or another term to add to your management jargon. It’s a holistic approach to your operation and how your team gets work done. Shared leadership gives your team a shared vision. It encourages all team members to provide input, provide recognition, and create solutions to problems. With shared support for a shared purpose, teams can find a greater sense of unity and investment in driving success. Instead of having one single manager acting as a leader, the team shares leadership responsibilities. People lead each other rather than everyone looking up to one person. All (or at least many) positions get more opportunity to support leadership concepts like accountability, autonomy, initiative, follow-up, and reporting. More people have a stake in the decision-making process, cutting down on the time and red tape that can slow work down. With a traditional management system, narrow expectations limit how individuals and teams perform. With fewer opportunities for collaboration and discussion, teams and their members feel pigeon-holed. Instead, a shared leadership model breaks down silos and keeps team members out of boxes with overly defined roles. This model creates space and flexibility for growth. Team members learn new things, experiment with different ways of thinking, and take on new responsibilities as they’re ready for them. A shared leadership model abandons the traditional hierarchy that many groups use, such as a pyramid with one leader above a small group of executives. There is no single chain of command from the top down. Instead, you have a collaborative environment that encourages sharing of information and creation of solutions as a whole, rather than individual parts. Flexibility. Nonprofits deserve more flexibility to address new opportunities (i.e., an event that may reach new donors). A shared leadership model allows people to shift responsibilities as needed so people and teams can address new opportunities while still moving work forward. No one person is the linchpin in a project, thereby freeing everyone to take on higher priority projects. Empowered teams. Shared leadership can give your team a chance to become invested in the success of the organization. Teammates become real partners. Rather than merely being assigned tasks for completion, members take responsibility for planning, delegating, and implementing solutions. Shared leadership models promote transparency for decision making, new ways to create processes, and redefining success. There is less focus on the choices that one person at the top makes and more emphasis on how the group can best operate. Stronger ideas. In a shared leadership environment, people take the time to consider more than one option. They brainstorm more effective (and maybe less conventional) methods. Instead of doing things a certain way because that’s how they’ve always been done, a shared leadership model allows for more out-of-the-box thinking from a wider variety of perspectives. When a team is willing to change the status quo, there’s room to find the best option. Harnessing everyone’s strengths. Most of all, shared leadership is an opportunity to highlight the strengths of each individual. You no longer have to assign all traditional leadership functions to a particular person based on their title. Rather than having one director of operations, for instance, you can give clear and appropriate responsibilities to a few qualified people based on their experience and assets. Your team can share the load as a team, focusing on the strengths of individuals to reach the team’s goal. With this model, there’s no need to keep responsibilities tied to a title. A lack of trust. For a shared leadership model to work, nonprofits must have a foundation of trust. Your team must believe that their peers will get their work done, that their managers will let them try new things and that the team has the same goals. Without that trust, a shared leadership model may devolve into a recipe for chaos and frustration. No buy-in from “higher-ups.” For a shared leadership model to work, you also need buy-in from everyone in the group. Shared leadership means shared responsibility, and all team members need to get involved. If some teams or individuals still hold onto a traditional hierarchy, it can cause tension, and the system may fail. Whether you have someone who insists on giving direction like a traditional manager or someone who refuses to take the initiative in driving processes forward, a lack of compromise and collaboration can create a breakdown. Weathering the change. Even if there are unity and enthusiasm on the team, change is always hard. Transition can be especially tricky for established organizations that have been successful using other methods in the past. It’s important to maintain transparency and have a clear vision as you begin the transition. You may see more issues, especially in areas like communication and strategy, as the workplace begins to shift. However, in the long term, many organizations will flourish with such a model. Clear goals and timelines can make the transition smoother and effective communication throughout any significant overhaul is always a plus. Implementing a shared leadership model is not a quick change. It’s not a simple shuffle of your org chart or a realignment of the management team. It’s a complete change to teamwork and leadership, and it takes time. It can take years to integrate these concepts successfully and, in reality, it may not be the best option for all groups. For example, if you don’t have the resources (time, staff, project management tools) to make this change, it may not be the best option, at least for now. However, the benefits can outweigh the growing pains for many nonprofits in the long run. A shared sense of purpose, investment in the organization’s direction, opportunities for team and individual growth, and stronger efficiencies in operation can create lasting success. Those benefits can make all the difference, especially for a nonprofit. Shared leadership, in many cases, can also prevent a stagnating operation and instead promote a thriving and dynamic organization.